There are many benefits of making your own food. You will be able to know exactly what is going in it to avoid any of the harmful ingredients that most companies include. Preservatives are very damaging to our health long term and should be avoided as much as possible, and yogurt makers can help. Yogurt is a superfood that many of us enjoy consuming, whether by itself, with fruit flavoring, or in desserts, and is very important to maintaining our health. They are made with protein, calcium, and many other vitamins that provide us with the nutrients we need to be as healthy as possible. To ensure that you only get these fantastic benefits and leaving out the preservatives that are found in the yogurt brands that are sold in grocery stores, you can make your own. You could always make it by hand, which will give you the same benefits as using a yogurt maker, but it will take a lot more time. All you have to do with a yogurt maker is add your already prepared yogurt mix, add it to the yogurt container(s), and set the timer for the amount of time needed. You will wake up with your yogurt ready for you in the morning to eat, made by you. So read on to know more about how the Euro Cuisine automatic yogurt maker works. If you have a large family or make yogurt very often, the amount that a yogurt maker can make will be an important feature to look out for while choosing the right one. The purpose of a yogurt maker is to make your life easier by doing most of the work for you. So, if you have to make the yogurt over and over again, you aren't saving as much time as possible. It is essential to get a yogurt maker that fits the amount that you need and consume on a daily basis. If you don't eat a lot of yogurt but still care about it being as healthy as possible, you can opt for a machine that makes less at a time so you won't have too much yogurt left over. Yogurt can only be saved for a certain amount of time, and you wouldn’t want it going bad. So making sure that you are investing in a yogurt maker to meet your specific needs is crucial so you can enjoy the product fully and meet your needs at the same time. Another key feature to look out for is the ability to time your yogurt-making process. Since it takes hours to make yogurt due to the fermenting process, you might want to do it overnight so it can be ready for you in the morning, since many of us eat it for breakfast. It will be hard to achieve this if we have to wake up in the middle of the night to turn it off when it is completed, especially if you are a heavy sleeper. Even if you are not, being disrupted from sleeping is not enjoyable. So, when looking for a yogurt maker, ensure that you can set how long you need to make your yogurt and if it has the ability to turn itself off. It is also important to keep in mind that there are different durations of time for yogurt to cook depending on your preferred consistency and the type of yogurt you are making. Yogurt needs about 8 to 12 hours to ferment, sometimes longer, so you will want to be able to control the amount of time so you can make your yogurt according to your preference. The Euro Cuisine automatic yogurt maker was specially made to ensure that customers could make the yogurt they love easier, with less time and energy being wasted. This company understands the importance of living a healthy lifestyle and has created a product that helps to incorporate this way of living affordably and efficiently. 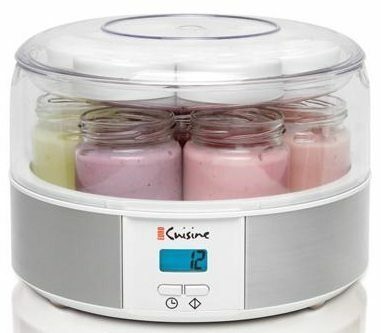 The Euro Cuisine yogurt maker is the perfect maker for those of you that want a product that is very easy to use and includes little to zero effort in making yogurt for yourself or your loved ones. It comes with seven 6-ounce jars that enable you to make different flavors at a time and make up to 42 ounces of yogurt at a time. So, if you like eating a lot of yogurt every day or have a family that loves it as much as you do, you won't have to worry about not having enough since there is so much to be made at one time. Even if you don't finish all of your yogurt immediately, there are date setting lids to place on the jars that allow you to know how long your yogurt will last. Another great feature about this product is how easy it is to use. All you have to do is add your yogurt mixture to the jars, set the timer for the amount of time you need, and wait for the time to be completed. It is that easy. Also, the timer goes up to 15 hours, giving you flexibility in the amount of time you can make your yogurt. One thing that many customers liked about this yogurt maker is that you can use your own glass jars as long as they are the same size as the ones included in the maker. There are a few cases that upon arrival, they did not receive all seven of the jars, so this is a good alternative if this is the case, although very rare. 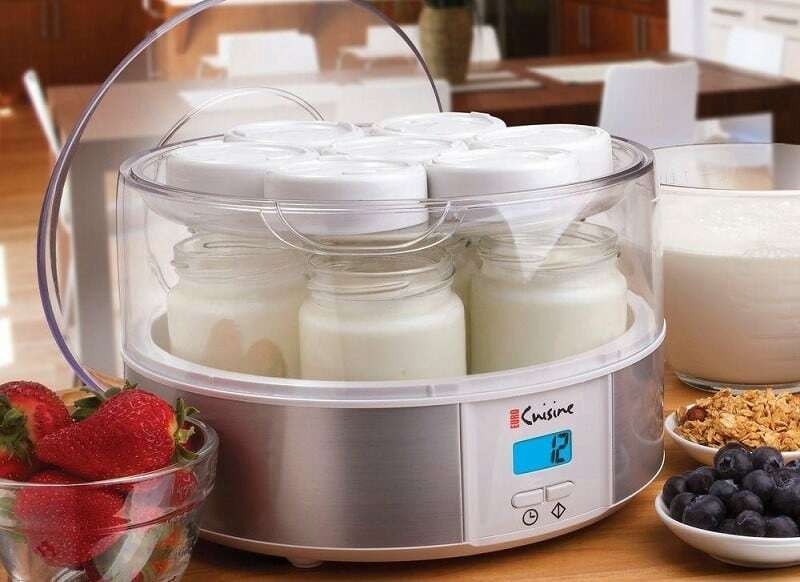 If you like the idea of having this yogurt maker and considering to add it to your kitchen, you will be happy to know that it is very affordable for the amount of quality that it has. The price of this product is about $50. 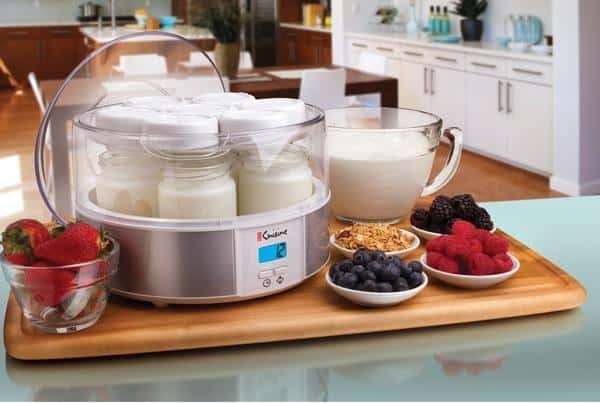 If you are looking for a yogurt maker that is easy to use, convenient, and more, than the Euro Cuisine automatic yogurt maker is the right choice for you. With its affordability and quality, you won’t regret your decision in giving this product a try. Thank you for reading.